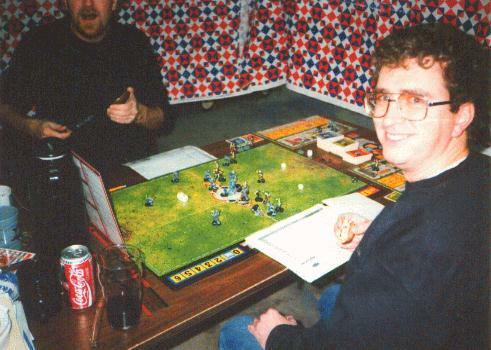 Without a doubt, one of our favorite games is Blood Bowl. 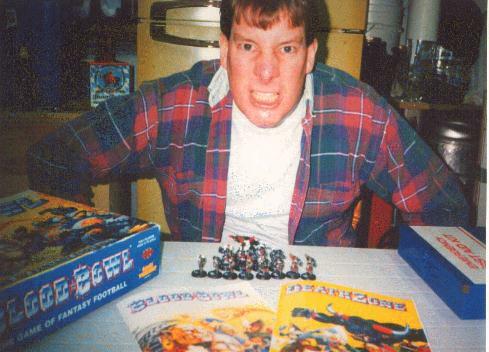 For several years now, we've had 7 to 10 players take part in out semi-annual Blood Bowl tournaments. A game that sustains so many replays is worthy of praise. 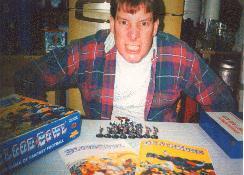 Blood Bowl is a trademark of Games Workshop Ltd. Please patronize them by buying this game. 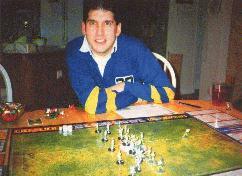 Often I play in the New Jersey Swamp Regional Spike Blood Bowl tournament. In progress League in effect until January 4th, 1998. Wonderfully recorded on video tape. Grrreat! Many casualties from heavy drinking. Our first tournament: a beautiful winter affair. Wonderfully recorded on video. Here are the tournament rules that our league typically follows. This year we are experimenting with the Experienced Character Rules that Jervis Johnson posted to the Blood Bowl mailing lists in June of 1995. We have created a Java applet that generates Experienced Characters according to Jervis' formula. Build a character at the Experienced Character Generator page. Following are newspaper accounts of various scrimmages and game events over the years. Here are a few pictures from the 1996 tournament. Follow this link to scanned images of my hand-painted figures. You may freely use these images for your own pages provided you link back to my page wherever the images appear. Warning, by its nature, this link is graphics-intensive. Last modified: Thursday, 09-Jun-2011 12:35:41 MST. Page hits: [an error occurred while processing this directive].